At our stem cell clinic in Charlotte, we work to use the most up-and-coming technologies to provide people with the pain relief they deserve. Stem Cell Carolina is always learning about the latest research and technology with regenerative medicine, and in today’s blog, we thought it’s only fair that we share some of this information with you. Stem cells are unbelievably promising in what they can provide. 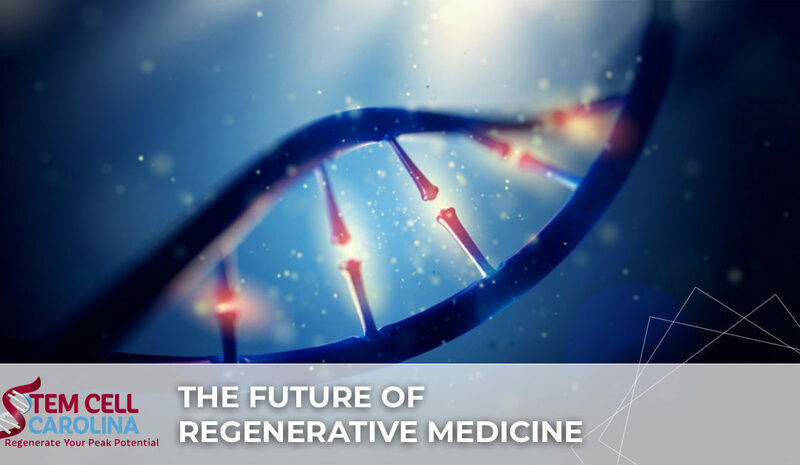 Take a look at some of the newest developments are and what the future of regenerative medicine looks like, and contact our stem cell clinic to learn more! As we get older, our bodies begin to deteriorate in a variety of ways. This is an unfortunate realization, even though it’s widely accepted as being a part of life — but is this always going to be the case? Stem cells can be used to develop into these RPE cells, which can target the ones in our eyes that aren’t working as well as they should be. There are still some risks in the early stages of this procedure — not because of the stem cells themselves, but the implantation process. In early trials, there were many patients with macular degeneration who ended up with better vision and no side effects. Parkinson’s disease affects 1 percent of adults over the age of 60, and happens when dopamine-transmitting neurons in the brain begin to die. It’s a frustrating and truly horrible disease, but stem cells are showing some initial promise in helping slow Parkinson’s disease, and improve the negative effects associated with it. Right now, a group of scientists and researchers around the world are collaborating together to use stem cells in a variety of approaches to target better therapy options. A number of rare skin disorders have begun to be targeted with stem cell treatments. Epidermolysis Bullosa is one such example. A genetic disorder that causes skin to tear “as easily as a butterfly’s wing,” scientists have been successful in using stem cells as a form of skin graft to treat this disease. This treatment made headlines as it saved a boy from Syria, and within six months of receiving this treatment, the boy was back at school. When caused by spinal cord injuries, researchers believe stem cells could be used to treat (and even reverse) paralysis. This form of regenerative medicine is still in the early stages, but a few people have reported improvements in their motor function after being injected with stem cells. Again, the type of stem cells that are addressed with this treatment are specific to the spinal cord, so people who are paralyzed for various other reasons likely wouldn’t experience the same results. Very small kidney-like structures have already been constructed in a lab with the help of stem cells. The idea with this type of stem cell treatment is that people could avoid having to wait on a transplant list for a new kidney — a process that often takes years. If people suffering from kidney disease could instead be grown a new organ, this would promote a faster turnaround time for healthier living. Instead of having to wait for a donated kidney, patients would simply be grown a new one. On another interesting note, the research that’s been conducted so far with kidney disease and stem cells has taught us a lot about how kidneys work. It’s also possible that hereditary forms of kidney disease could be targeted with the use of stem cells. We don’t really know a lot about how stem cells could help cure HIV, but the earliest forms of evidence are nothing short of stunning. As of November in 2018, only one person is known to ever be completely cured of HIV. This was a man (known in the medical community as “the Berlin patient”) who received stem cell transplants from the same donor back in the mid-2000s. He received these transplants because on top of having HIV, he had been diagnosed with leukemia. After his stem cell transplants, his HIV simply went away. Considering HIV has widely been known as an incurable disease, one which can only be treated and managed, the developments in stem cell usage with HIV are proving to be radical. Nearly a third of all elderly men are affected by male hypogonadism, a condition in which the body produces a very low amount of testosterone. In addition to mood changes and lowered libido, muscle and bone strength levels can both decrease substantially. The current method of treatment is providing hormone replacement therapy, but this can have some serious side effects (including deep vein thrombosis). More recently, labs have been trying to recreate a specific type of cell that lives in the testicles, then directly reprogramming them to help testosterone levels get back on track. So far, mouse skin cells have been used to be turned into these types of testicular cells, and when tested with mice, the results have been overwhelmingly positive. Some of the hormonal changes that adults face in older age could all be addressed with the help of stem cell clinic around the world. The research is showing promising and positive change for those dealing with hormonal imbalances. At Stem Cell Carolina, we are at the forefront of these incredible medical developments. Our stem cell clinic is here to provide you with the many treatment options that you’re looking for. By getting in touch with our Charlotte treatment center, you could find out if you’re a good candidate for stem cell therapy. The future of stem cell research is happening now, and the medical benefits could help you. Give us a call to set up a consultation, or fill out our contact form online and we’ll get back to you shortly!